Along with the rest of the world I was convinced that all the colors are contained in the light; no one had ever told me anything different, and I had never found the least cause to doubt it, because I had no further interest in the subject. But how I was astonished, as I looked at a white wall through the prism, that it stayed white! That only where it came upon some darkened area, it showed some color, then at last, around the window sill all the colors shone... It didn't take long before I knew here was something significant about color to be brought forth, and I spoke as through an instinct out loud, that the Newtonian teachings were false. Schopenhauer would later write that "[Goethe] delivered in full measure what was promised by the title of his excellent work: data toward a theory of colour. They are important, complete, and significant data, rich material for a future theory of colour." It was a theory, Schopenhauer admits, that does not "[furnish] us with a real explanation of the essential nature of colour, but really postulates it as a phenomenon, and merely tells us how it originates, not what it is." Another later philosophical interpreter of Goethe, Ludwig Wittgenstein---a thinker greatly interested in visual perception---also saw Goethe's work as operating very differently than Newton's optics---not as a scientific theory but rather as an intuitive schema. Wittgenstein remarked that Goethe's work "is really not a theory at all. Nothing can be predicted by means of it. It is, rather, a vague schematic outline, of the sort we find in [William] James's psychology. There is no experimentum crucis for Goethe's theory of colour." Yet a third later German genius, Werner Heisenberg, commented on the influence of Zur Farbenlehre, writing that "Goethe's colour theory has in many ways borne fruit in art, physiology and aesthetics. But victory, and hence influence on the research of the following century, has been Newton's." I'm not fit to evaluate the relative merits of Goethe's theory, or lack thereof, versus Newton's rigorous work on optics. Whole books have been written on the subject. 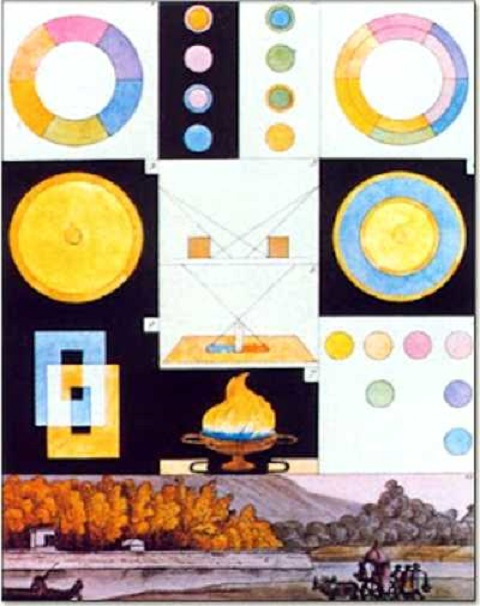 But whatever his intentions, Goethe's work has been well-received as a psychologically accurate account that has also, through his text and many illustrations you see here, had significant influence on twentieth century painters also greatly concerned with the psychology of color, most notably Wassily Kandinsky, who produced his own "schematic outline" of the psychological effects of color titled Concerning the Spiritual in Art, a classic of modernist aesthetic theory. 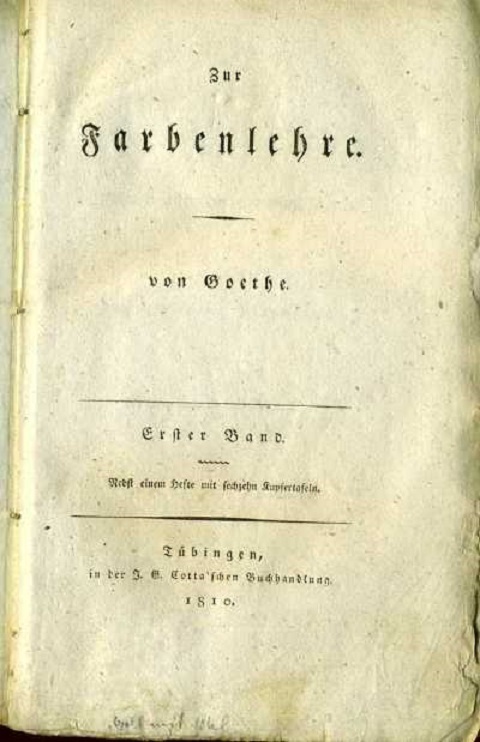 As is usually the case with Goethe, the influence of this single work is wider and deeper than he probably ever foresaw. 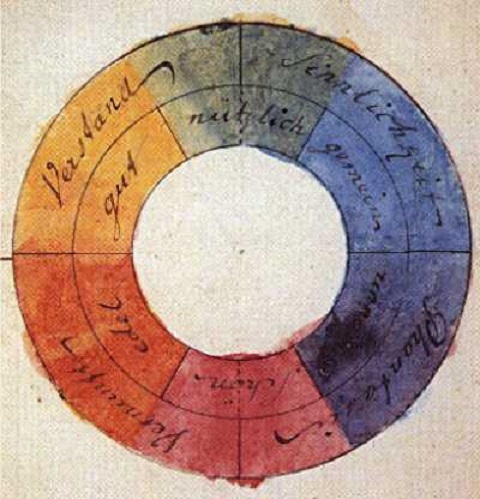 You can find Goethe's Theory of Colors in our collection of 700 Free Ebooks. It's also available in audio format in our collection of Free Audio Books. An affordable version can also be purchased on Amazon. A review of a book about color in movies. Thanks for the great little article. The repeatedly observable fact is that colours generated in and through prisms never originate from a “rainbow spectrum”, but always from pairs of variably separated bands of colours related to relative dark-light contrasts. These bands are about equal in overall width, with the central stripe of each less distinct than the outer two. Initially, no green colour occurs nor any spectrum. The appearance of a “rainbow spectrum” is a secondary effect, a parlour trick that can be accomplished in several instructive ways. 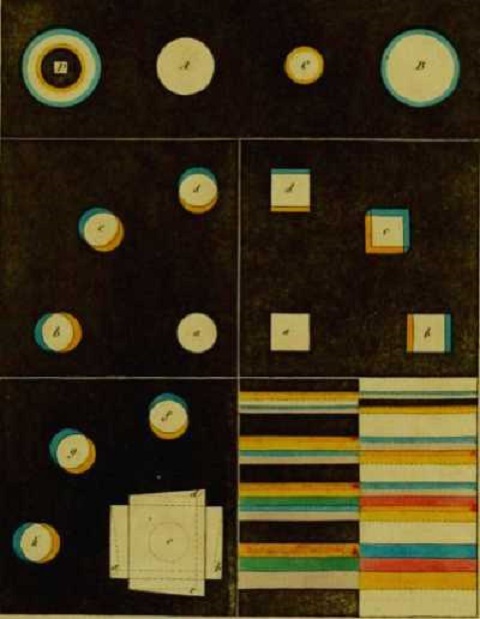 The first method is the one used by Newton to put over his farcical, but mathematically accessible, idea of colour production. Of course, the method of the scam in this case is to reduce the body of white light to where the otherwise and actually separate colour bands slightly overlap or intersect. This is the basic principle of all forms of the scam. This first method allows a portable result, the narrow beam of light, to avoid the embarrassing drawing together of the two pre-existing colour bands, where the colours actually originate. The fact that the colour bands arise separated by variable distances (i.e. refractive angles) means that the blue colour is not the “other half” of the same light that is behind the red band. This is only implied by the scam spectrum. The scam spectrum also hides, or makes hard to discriminate, that the purple and violet stripes of the blue colour band are actually projected or illuminated in front of relative darkness, from the side; the complete red colour band is clearly seen to be shone through from behind. These three facts do not readily suggest a uniform approach along any lines put forward by Newton, etc. The “rainbow spectrum” is not created by one unified beam of light being split into colours, but from two diametrically opposite, separate beams of already coloured light being brought together by reducing what separates them to where they combine to create the otherwise non-existent green colour. An equally applied “differential refraction” is not an option. This first example has the light going through the prism and the colours being observed on a surface. It is also possible to create the scam by observing the colour bands directly through the prism. If you look at a bright window, through a prism, you will notice the colour bands on either side of the window, along the line of refraction. Now we can see the reason for a concept like refraction, when we twist the prism back and forth and see the dramatic narrowing and broadening of the light image of the window. This measurable phenomenon is the basis of refraction, and therefore of differential refraction, and it is this that allows us to produce a second version of Newton’s Scam Spectrum. If you twist the prism far enough, you reduce the light of the window to where – voila! – you have the “rainbow spectrum”, down the line of refraction. But there are some problems here. No matter how you broaden or shrink the window image, the colour bands remain unaltered to any visible extent. This at least suggests that they occur after the light is bent. They merely move and follow the light-dark contrast line. When brought together, both bands move towards the narrow angle of the prism, but the red one moves much more quickly and “catches up” with the blue. They remain unaltered until reaching the scam spectrum, when they begin to overlap or intersect, with the yellow and blue stripes changing to green, until they merge and are replaced by one green stripe. Only now do the colour bands begin to shrink, but not equally. Orange and purple disappear first, with red, green and violet disappearing together as the light is choked off. Furthermore, the colour bands have the ability to move in two different directions, or at different speeds, within themselves. Let me explain. There is a small shelf edge projecting into the window view, and this shows the identical red band as the side of the window, but much shorter and projected about one and a half band widths into the window. Now as you tilt the prism to shrink the window, this shelf projection shrinks in accord with refraction, until about three colour band widths from the blue band, it disappears into the overall edge. But throughout this entire span, the small colour band has been following the shrinking shelf, moving backwards into the main edge colour band while the whole moves forward. No “differential refraction” can accommodate these appearances, disappearances and movements. Prisms certainly should be accorded much more honest, interested study. Another way of producing Newton’s Scam Spectrum requires a bit of set-up but is, I think, worth the interesting results. The creation of colour in a prism is repeatedly seen to be more closely related to relative dark-light contrasts than to either refraction or any necessary red – blue continuum. This change of colour from blue to red down the line of refraction, merely because the background changes from relatively dark to relatively light, shows up as lies all the concepts of prismatic colour production put forward by Newton and his idolizers. The fact that the blue band abuts the red one on the same line of refraction is also absolute proof that, far from being parts of a rightfully belonging together “rainbow spectrum”, the colour bands are indirectly related to each other at best. 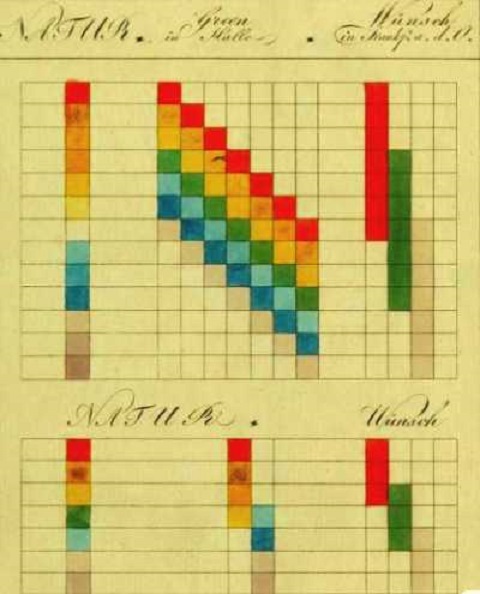 This shows the absurdity (if previous evidence hasn’t) of there being any possibility of refraction, differential or otherwise, in the production of these phenomena of colour. The only certain relationship to refraction is the left-right orientation of the bands, and probably their width. The trick to Newton’s Scam Spectrum in this case is the narrowness of the pole. Staple a sheet of writing paper to the pole and you will see the colour bands separated. Finally, and less explicitly, by twisting around a prism in sizeable bright light, the “rainbow spectrum” can be seen projected onto surfaces, represented by at least three examples. One duplicates the window method, with a bright spot that is reduced by twisting the prism until the bands meet. Another has the bright spot visible on a card near the prism, but reducing in size until 8-10 feet away (in this example) a “spectrum” appears. The third traces back to the ninety degree angles of the prism, but shows no bright spot. It is aligned with the bands on either side of the angle and is certainly a projective version of the narrow pole effect. These are the few methods I have been able to attempt; I’m sure there are others. Again, every supposed colour spectrum arising from a prism can be resolved into the actually existing separate colour bands. These arise in prisms at opposite sides of the body of light, adjacent to relative darkness. The light involved in the red side of the scam spectrum is not involved in the creation of the blue side. It should be noted that the “inverted spectrum” compresses to produce a magenta stripe that replaces the red and violet ones, as the otherwise non-existent green replaces the blue and yellow. Any physics of prismatic colour relationships, that is not fantasy, will have to address four initially occurring colours, plus four derived from their combining. The prismatic “seven colours of the rainbow spectrum”, with everything derived from it, have been made up for mathematical convenience and easy salesmanship, and do not represent soundly reported investigative science.